Labradoodles are a mix between a Labrador Retriever and a Poodle. 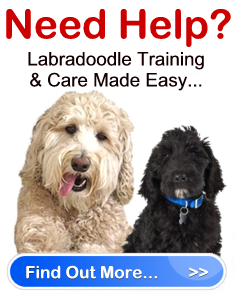 Labradoodle training is farily easy as they are very social, loving and highly intelligent canines. The main problem can be coping with their short attention span and natural exuberance. The Labradoodle breed is available in standard and miniature sizes. It is important to note that there are two types of Labradoodles – The Australian Labradoodle and the American Labradoodle. The following information will be focused on the American Labradoodle, which is considered a hybrid dog. Unlike the Australian variety, the American type only uses Poodles and Labrador Retrievers for breeding. Labradoodles are a very active and affection breed that take the best traits from both their purebred parents. The history of labradoodles began in the 1970’s in Australia. They were first developed by Wally Cochran. Cochran was encouraged to start the cross breed between the Standard Poodle and the Labrador Retriever by a blind women who suffered from dog allergies. The initial mating of the two breeds was quite successful and three low-allergy pups were produced. The first hybrids produced surpassed the best qualities of both purebreds. Due to this fact, Labradoodles became extremely popular in Australia and more breeders began crossing the breeds. However, as cross breeding continued, the offspring produced were not consistent. Some were low shedding and allergy-free, while others lacked these qualities. When it comes to eliminating allergies in a breed, this doesn’t only mean producing a dog that sheds little hair. It also means eliminating other allergies such as dander and salvia. The goal was to create a breed of dog that was hypoallergenic but still had high intelligence and a friendly temperament. Therefore, since it was clear that research was required to produce the desirable Labradoodle, and the dog was in high demand, two research facilities were developed during the 1980’s in Australia to create the ideal Labradoodle. As was previously mentioned, the reason why Australian Labradoodles are different than those produced in America is because the Australian variety has used other breeds aside from the Standard Poodle and Labrador Retriever. Other dogs that have been used to create the Labradoodle breed in Australia include Wheaton Terriers, Curly Coated Retrievers, Two types of Irish Water Spaniels and a Poodle/Cocker Spaniel cross. Labradoodles are still under development and, therefore, cannot be declared a true breed. The reason is because a true breed is one that produces consistent characteristics each time to form a standard. Due to the fact that three different types of Labradoodles can be currently bred, for now, they are still only considered a hybrid breed. Thus, the Labradoodle is not recognized by any major kennel clubs and are not part of a specific dog group. Labradoodles are pleasant dogs that are affectionate, noble, obedient, highly sociable, friendly, loving, loyal and comical. This breed loves to engage in play and activity and is extremely docile and non-aggressive. These characteristics effect how we undertake Labradoodle training. They make excellent family pets and are patient and loving towards children. Both the Standard Poodle and Labrador Retriever breeds are incredibly intelligent. They were both originally developed for hunting and retrieving purposes, and love the water. Thus, it should come as no surprise that the Labradoodle is a smart dog that enjoys being active and requires plenty of exercise (I.E. three walks daily, the freedom to run around, swimming and play time). Therefore, these dogs are best suited to homes that have at least a small yard. That being said, the miniature Labradoodle variety makes suitable apartment pets. Since the Labradoodle has been produced from two highly intelligent breeds, they are easy to train and catch on quickly. Therefore, they can be trained for the same jobs as their parents including: police work, hunting, guide dogs and therapy dogs. However, keep in mind that even though the Labradoodle will alert their owners to the presence of a stranger, they do not make a good guard dog. Labradoodles live an average of 14 – 16 years. They are prone to some health problems such as hip dysplasia (which is common in both the Poodle and Labrador breeds), and ear infections. Other than that, they are a relatively healthy breed. Nevertheless, their health is still being closely monitored in case more issues arise. The Labradoodle is available in three different coat varieties: Fleece, Wool/Curly and Hair. The fleece and wool/curly types are low shedding, with the fleece being the most desirable and the wool/curly the most hypoallergenic. However, the hair type tends to shed profusely and is not hypoallergenic. Furthermore, some puppies that do not trigger allergies at first, may do so later when they begin shedding. Remember, the breed is still under development, so it will be a while before any guarantees can be made. The coat requires daily brushing, a clipping every few months, and the occasional bath. In addition, the coat is available in a variety of solid colors including white, black, brown and red. Labradoodles are popular dogs that bring much joy to the lives of their owners. They are often a fantastic alternative for those who love the Labrador breed but have been unable to own one for allergy reasons.